This article explores the intersection of the inner and outer work of regenerative change making through contemplative practices at Portland State University. It describes contemplative strategies employed with graduate students and university faculty including classroom practices and a professional development retreat series for faculty. The authors discuss the importance of inner work in fostering transformative teaching and learning, and explore the connections between inner work, contemplative practices, and transformative learning theory. 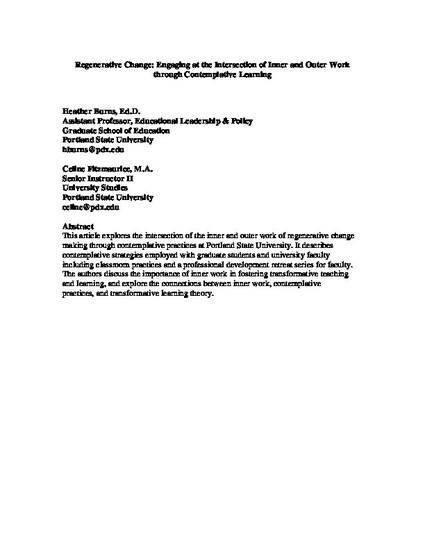 This paper was presented at the International Transformative Learning Conference, Oklahoma City, OK.
Fitzmaurice, C. & Burns, H. (2016). Regenerative Change: Engaging at the intersection of inner and outer work through contemplative learning. International Transformative Learning Conference Proceedings 2016.